Roasted Poblano Pepper Chicken Salad! 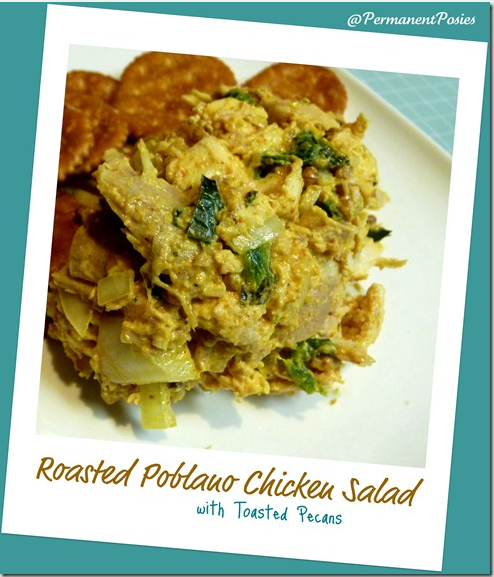 You are here: Home / Recipes / Dinner / Roasted Poblano Pepper Chicken Salad! Mix it all together and serve on toasted bread, on a tomato or avocado half, or with crackers. This tasty little treat was made by my husband, the King of Chicken Salad. It is his specialty and he never makes it the same. The kids used to say that his style of cooking was to open the frig and pull out everything he could find…..mix it together into a casserole or soup….and Voila! Supper! He has a knack for putting together flavors and though they made fun of his methods, they always ate every bite. This is what he does with chicken salad. Check out this other blog post I made last year of one of his chicken salads…..Mediterranean Chicken Salad. checked that link with Norton Safe Web and it was labeled as CAUTION. You may want to check it for yourself at http://safeweb.norton.com/report/show?url=groceryshopforfree.com. Which link? the one going to my site from here?